More and more hamster owners are choosing to up the standard of hamster cages. Many do that through designing gorgeous natural setups. Natural hamster cages are a mystifying concept to some, so we’re here with the information and ideas needed to clear things up. 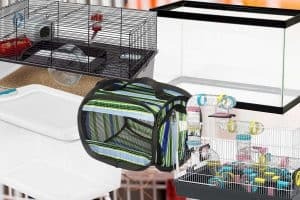 Natural hamster cages are often referred to as “German-style hamster cages.” These housing solutions better mimic a hamster’s natural environment. Through the incorporation of all-natural materials, from the bedding to playthings and everything in-between, hamsters are believed to live happier and healthier lives. This might sound rather vague, but that’s because there is no one “right” way to make a natural hamster cage! You are free to use the resources available to you to create as simple or as elaborate a cage design as you want. Continue reading to learn what types of materials make for a great, natural hamster home. We’ll also show you how to keep these spaces clean, and even show you some examples of what other crafty hamster owners have created! Why Choose a Natural Hamster Cage Design? Consider the fact that wild hamsters live in dry, warm areas. From deserts to steppes, these nocturnal, burrowing creatures naturally live in areas drastically different from what we expose them to at home. What makes up the “conventional” cage design that many hamsters live in? Plastic is a big part of it, isn’t it? Toys, tunnels, dishes, bottles, sand baths and hamster houses are commonly made of plastic. Size is another concern, as hamster cages tend to be taller than they are wide. 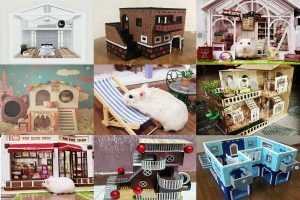 This prompts many hamster owners to build multiple levels inside their hamster’s cage, in hopes of creating more useable real estate. One reason why natural hamster cages are called “German hamster cages” is due to the fact that German people have an entirely different approach to caring for hammies. They ditch the plastic for natural materials and give their pets more space to explore and hide, as a hamster’s nature inclines them to do. It’s not uncommon for German hamster cages to exceed 360 square inches in size. Which Materials are Used in Natural Hamster Cages? As you can guess, the aim is to switch out as many artificial components for natural ones as possible. This gives you a wide selection of materials to use in any number of ways. You should, however, make sure that each item introduced is safe for hamsters. While this list is only a rough guideline as to the types of materials commonly used, it is a great starting point. As long as the material is natural and 100% hamster-safe, it can be used in a German-style hamster cage! What Kind of Cage Should I Use? 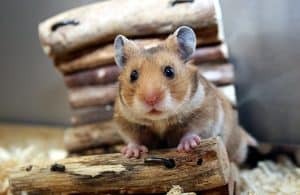 Before you go through the painstaking process of buying or making natural items for your hamster’s cage, you need to make sure that you have the proper type of cage. Conventional barred cages are typically a no-go for naturally-themed hamster habitats. They don’t look great, are made of plastic or metal, and enable a bigger mess outside of the cage. Instead, opt for a glass alternative. Glass tanks, like those used for lizards or fish, are already a popular alternative to cages with bars. They reduce mess, look great, and allow you to peek in on your hammy at any time without disturbing them! Consider how wonderful this natural cage setup looks. A barred cage wouldn’t look nearly as good and would obviously detract from the natural aesthetic you’re going for. It might be hard to envision what we mean when we say, “natural hamster cages,” even with the information above in mind. One of the best things that you can do before crafting a natural cage of your own is to draw inspiration from what others have done. The hammy community loves to share their creations with others! As you can see there are still some not-natural elements, but this Pinterest user has created a great German-style cage all the same. The substrate is great for easy burrowing and their hammy clearly has plenty of space to explore. Do you see the little, wooden bridge that connects the floor of the cage to the little hamster house? Bendable bridges are used in many natural hamster cages due to their versatility. Bridges like the ones made by Hamiledyi can be used in their ordinary shape as a bridge or as a ramp for your hamster to help them get around. In this cage, you can see that there is wood everywhere! This is a great and easy way to keep things natural, as many different types of wood are safe for use around hamsters. For an item that combines the natural aesthetic with safe and healthy functionality, try adding wooden tubes to your hamster’s cage. These tubes by Niteangel are all-natural and help to stimulate a hamster’s natural exploratory instincts. Of course, the wood you use doesn’t have to always be shaped into a tunnel to be useful. Your hamster may enjoy climbing over pieces of sterilized drift wood, or even wide sticks that you have gotten from your yard. You should try to fill your hamster’s home with as many of these natural elements as possible, without making the place too crowded. For those without the skill, patience or time to make a multi-chambered hamster house out of natural materials, consider this elaborate house by Niteangel. This unit combines the fun of bridges, tunnels and burrows all into one. While the examples above have shown you some great ideas to get you started, there are some subjects that we’d like to touch on in a more in-depth fashion. Chewing is important for many hamsters, as it helps to keep their teeth clean and alleviate boredom. Natural chewing sticks serve this purpose and help to reinforce the all-natural vibe of your hammy’s cage. This variety pack by FLOURITHING provides three different flavors for your hamster to love and allows them to chew to their heart’s content without any artificial preservatives or flavor additives. One thing that might be hard to gather, judging from the examples we showed above, is what type of substrate/bedding to use. Many owners will use different types of material, either separated by section in the cage or topped with one another to create a realistic and burrowing-friendly environment. Soil is used often in natural hamster cages, though it’s important to be sure to buy a hamster-friendly type. Some soils contain minerals that could harm your hammy. Stick to organic potting soil. You can also consider adding Aspen shavings on top, to help facilitate burrowing behaviors. Sand is another popular option. However, you must be careful to buy sand that doesn’t produce much dust, as this can lead to respiratory issues in hamsters. You can section off a sand bathing area for your hamster or use the sand in a larger section of the cage. Reptisand and Chinchilla sand are extremely popular options for this. You have seen several examples of natural hamster homes now and have likely wondered about the plants used inside them. Cat grass and dry willow are often added to natural hamster cages for aesthetic purposes. You shouldn’t try growing live plants inside of a hamster’s cage. This is difficult to do successfully and takes up space that could be better used by your hammy. Meadow grass and hay are often used, as well, to mimic a hamster’s natural environment with natural and safe materials. The way that we often house hamsters is quite contradictory to the way that they live naturally. The addition of plastics and small cages has been more for human convenience than for the hamster’s benefit. 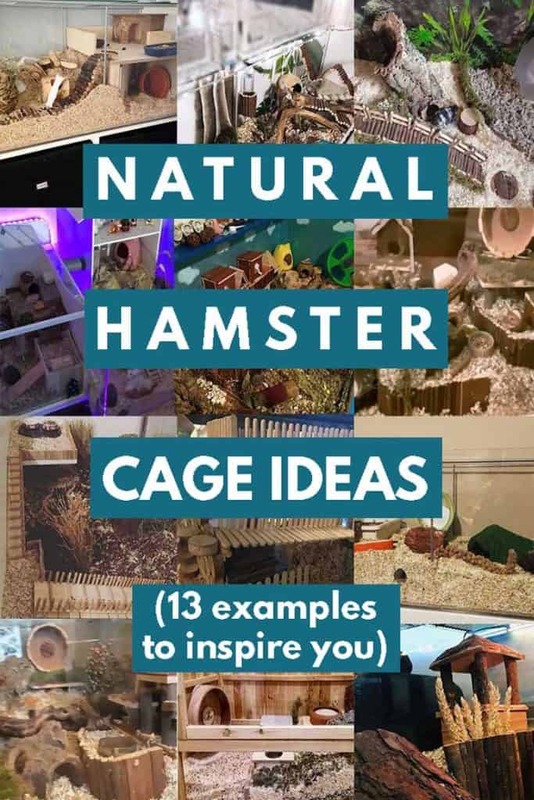 While there’s no saying that your hamster can’t live happily in a spacious, conventional cage, there is certainly something to be said for the all-natural approach. Natural hamster cages are a great way to help your hamster remain connected with their natural instincts. By creating a large, natural and healthy environment you are closely mimicking what your hammy would experience in the wild. Use the examples posted above to gather inspiration for your own German-style hamster enclosure. When you have an idea as to what these cages entail, you can get creative by adding your own elements and personal flair! There is no limit as to how far you can go, how elaborate or simple your design may be, or how large the cage itself is. Stick to all-natural materials as much as possible and observe your hammy for the first few days in their new environment. It may take some troubleshooting before you create a floor plan that is safe and fun your hamster, but don’t be discouraged! The end result, a cage that you and your furry companion are both satisfied with, is worth it.